Summon: Deal 2 damage to an enemy creature or give a friendly creature +2/+2. Skywatch Vindicator is an epic Mage creature card. It is part of the Core Set. "By the firmament, I will end you!" 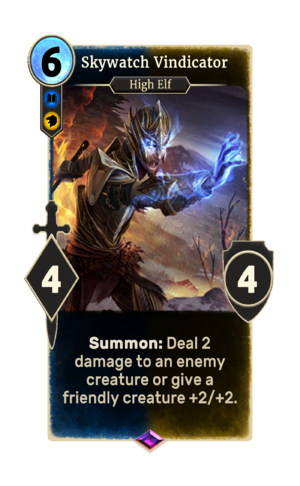 The card is named for the Summerset city of Skywatch. This page was last modified on 16 February 2019, at 15:37.